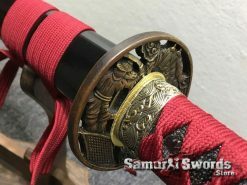 There is a lot of rich history that surrounds the Katana sword. 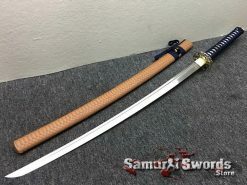 This sword is a traditionally made Japanese Katana used during the feudal period in Japan. 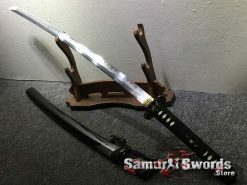 Samurai Katana is characterized by a single edged curved blade with either a circular or square guard. 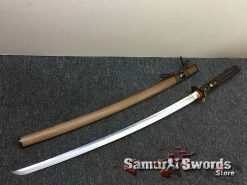 This Katana sword has a long grip and can accommodate both hands of the Samurai. 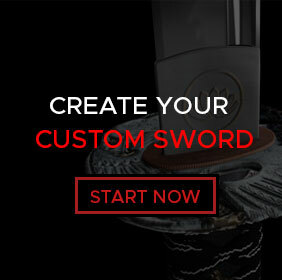 There are actually six different periods when the production of swords in Japan took place. 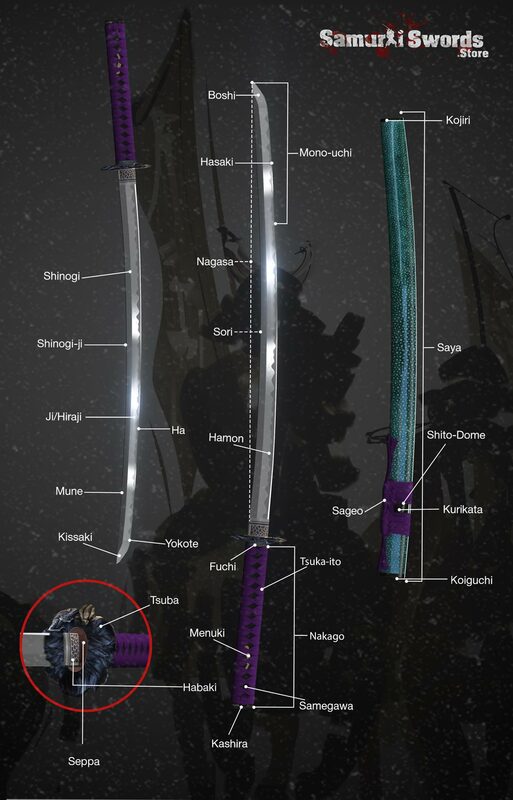 Katana is also known as Gatana which describes a long sword to differentiate this sword from that of the tachi. 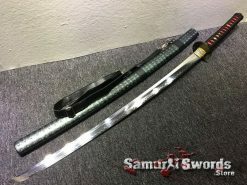 However, tachi was the inspiration for the Katana. 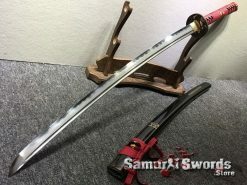 Katana were traditionally made from Japanese steel using different folded layered steel with various carbon concentration. This process actually removes the impurities. Older steel has higher oxygen concentrations and can be easily stretched to remove the impurities. 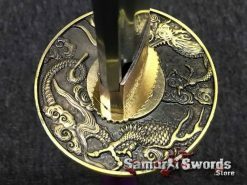 This process is made during the hammering phase were a stronger Katana is forged. 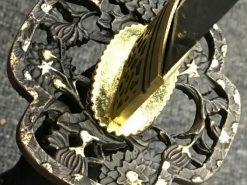 The edged of the blade is coated with a thinner layer of clay. Because of the process of hardening and quenching this causes the blade to harden and curved. This is because of the difference in densities applied to the steel. 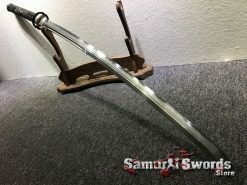 After the forging process, the Katana blade is sent to be polished. 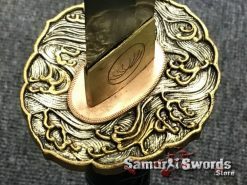 This produces a mirror finish which improves the aesthetics of the sword. 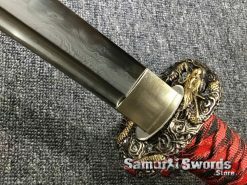 A matte finish is given to the blunt edge of the sword to emphasize the hamon. 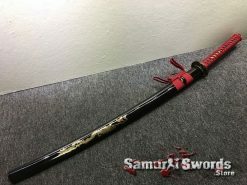 Because of the changing way to do combat, Samurai warriors prefer using Katana sword. During combat, it was essential that the fighter needs to quickly draw his sword. 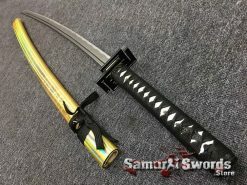 It was this quick response time that save the lives of the owner hence the preference for Samurai Katana. 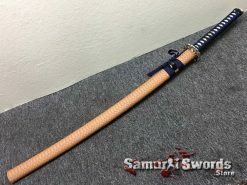 This sword was convenient to use because it can be worn with the help of a belt like sash or obi. The warriors wore the sharp edges facing up. 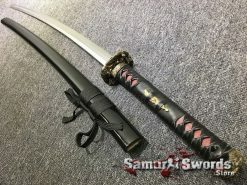 The Katana has evolved throughout the course of Japanese history. During the early 16th century the average length of this sword was only 60 cm however, by the late 16th century this has been change to 73 cm. 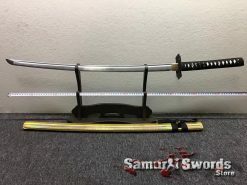 Katana was often paired by a wakizashi or a smaller sword. 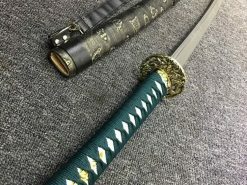 Wearing both the Katana with the wakizashi was symbolical because only those who have social power and deeply revered fighters were given the honor to wear the daisho. 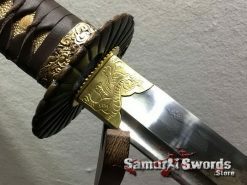 Daisho is another term given for the wakizashi when worn by Samurais. 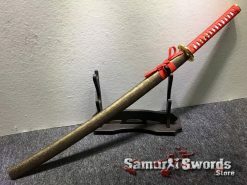 Gradually, the samurai class was disbanded and the privilege of carrying these swords in public was prohibited during the Meiji period. 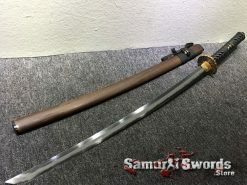 It was the Haitorel Edict of 1876 that only allowed the carrying of these swords only to the Samurai lords or daimyo, police and those who are in military. During the Meiji period, skilled swordsmith whose trade was once thriving are having trouble making a living. The Meiji period saw the modernization of Japan’s military force. Swordsmiths were forced to make other kinds of implements mostly used in farming. The interest in Katana again revives during the military action by Japan against China and Russia. It was during this period when these swords were produce in mass scale. 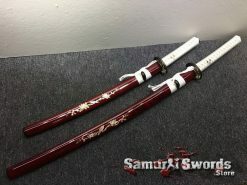 Because the swords were used for a different purpose these were referred to as gunto or military swords. During pre-World War II, because of military buildup in Japan, all military officials were ordered to wear a sword. 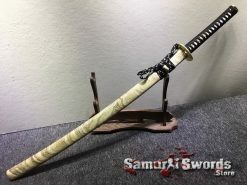 Traditionally made Katana were produced during this period however, due to the large volume of orders even blacksmiths with little experience manufactured swords. Since supply of steel or tamahagane were limited, these swordsmith used other forms of steel. Everything was done quickly which means lack of quality. Forging was done quicker as well to produce showato or non-traditionally made swords. 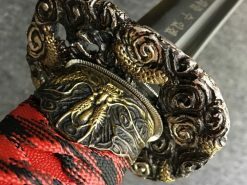 To control the situation, the Japanese government required placing of special stamps on the tang or nakago to let users know that these were traditionally made swords. 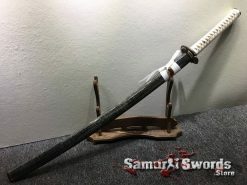 Today, showato is not considered as true Japanese swords and are confiscated. However, outside of Japan these are collected for its historical value. During Post World War II, making swords was banned. 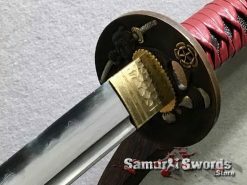 By 1953, Japanese swordsmiths were only allowed to work if they follow certain strict conditions which include a license and a five year apprenticeship. On top of this, only two swords were allowed to produce in each month. 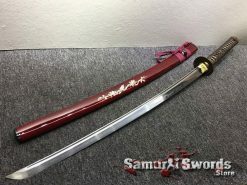 After the sword was produce, it must be registered with the Japanese government. 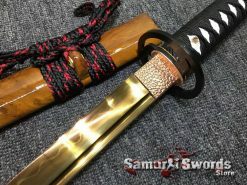 During the same period, outside of Japan, modern Katana were produce by western swordsmiths. They use modern steel alloys. These were used for martial arts as cutting practice. The use of modern steel has its advantages because it created stronger blades that cannot be easily destroyed. Mass produced swords following the shape of the Katana were produce mainly from China. 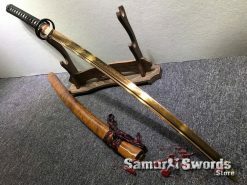 some swordsmith used different techniques and kinds of steel though that does not follow the traditional way of producing these swords. 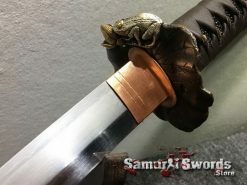 our swords are made in the traditional way of making a Japanese Katana sword, while all aspects of this sacred art is being followed to the smallest details. 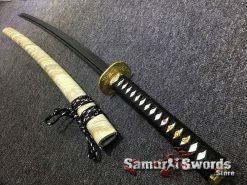 Katana sword was used by samurai for practicing and for martial arts. 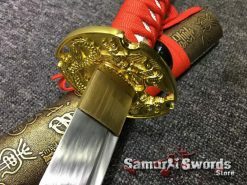 Modern martial art uses a variety of this sword. 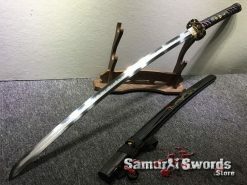 Some of the martial arts that use this sword include iaido, kendo, aikido and ninjutsu to name a few. 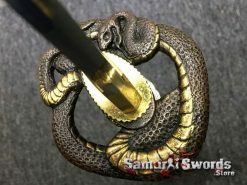 It is a must to handle the sword with care when you don’t use it. 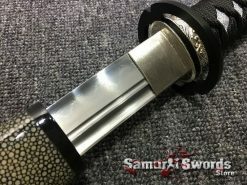 There is a tendency for this sword to be damage beyond repair when storage is not done properly. The blade must be stored horizontally. To maintain the edge, the sheath must be curve down and its edge facing upward. 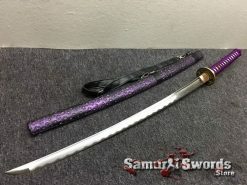 Additional information about handling this sword includes oiling, powdering and polishing it from time to time. Natural moisture has the tendency to leave behind residue. The dirt and oil coming from the users’ hands will cause the blade to rust. It is essential to clean the sword thoroughly. The traditional way of cleaning it is with the use of choji oil. 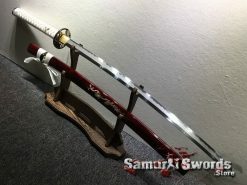 When storing the Katana for a longer period of time it must be aired out. Molds may form and again contribute to its damage.